Water pressure issues? Let it flow! Most of my articles are about technology and software development, however I recently purchased a new home and, as I worked on various things around the house I realized others might benefit from a few of the more common issues I've addressed. Some of these problems might seem simple to fix, however I figure there are others like me who are learning these things for the first time and might find my experiences helpful. Problem: Water pressure is fine at first, but within a few seconds flow decreases significantly. The hot water never gets beyond warm, but both hot and cold suffer from the same decreased flow. Diagnosis: It's important to distinguish between water pressure and volume. Low water pressure results in a lower flow as soon as valve is opened. This can result from undersized pipes or the use of valves/connections that reduce flow as well as simply receiving low pressure from the source. 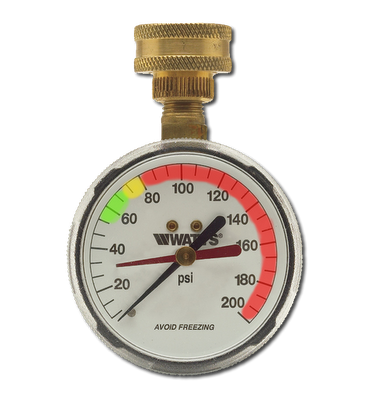 A volume issue results from some restriction farther down the line that allows a higher pressure to build over time, but once that pressure is released (such as in the first few seconds of running water) then the pressurized volume is exhausted and flow is limited by the restriction. If both hot and cold lines suffer from the same symptoms then the problem most likely exists on the main water line before the water heater. Solution: Every situation is different, but in my case I found that the main cutoff valve at the meter box was not completely open. One and a half turns more and the restriction was gone restoring full flow to the house. If you've run into a similar problem I'd love to hear about it. Comments are appreciated and you can find me on twitter (@gainesk).